Yesterday someone in one of my writers’ groups on Facebook posted about a recent upsetting experience. She’d told her family that her book was coming out later this year in July, and that she had other books on the way too. Apparently her family’s response was entirely negative, telling her that only rich and famous people actually called themselves authors, and that she should keep her head out of the clouds and on the ground because she obviously wasn’t one. Not only was this reaction just plain horrible (we should be getting tons of love and support from our families for our writing dreams, not criticism and put-downs), but it’s also ignorant. While not all authors become rich and famous, they don’t need to be to be called authors. And even the rich and famous ones, which are rare to begin with, started out as dreamers with a manuscript they wanted to get published. Seriously, every one. JK Rowling was a single mother living on state benefits while writing Harry Potter. Stephen King was a teacher with three kids and not a lot of cash before the paperback rights to Carrie allowed him to move up the economic ladder a little. HP Lovecraft never saw true success in his lifetime, but he’s considered one of the most influential authors in modern-day horror. We all have to start somewhere. But that’s beside the point. What I’m actually trying to say is that fame or finances are horrible ways to measure whether or not someone should be called an author. Someone could have millions in the bank or have a reality show and a famous spouse and write terrible fiction. No, if you’re going to measure by what right someone has to be called an author, then do it by how passionate someone is about writing, and by how their work resonates with others. If someone is very passionate about writing, about telling stories and sharing them with others, and that person’s work resonates with readers, I really think they deserve to be called an author. And in the case of this particular author, she’s clearly passionate about her writing, and it resonated enough with her publisher that they want to publish it and believe it’ll do well in sales. In my eyes, she definitely deserves to be called an author. Of course, there are always people who feel they know better, whether or not they’re inside the industry, and there will always be people who just want to put others down just so they can put others down. I run across those people from time to time. I can’t say which kind the family of the author I’ve been talking about it, but I know what response I would give them: Screw you. Those people don’t hold any power unless you allow them to, and your own opinion of yourself and your work is more important than what they have to say. And if they’re only going to say hurtful or denigrating things, then maybe it’s best to put them aside and find people who will give you the support you need. Let them stew in their own negativity. 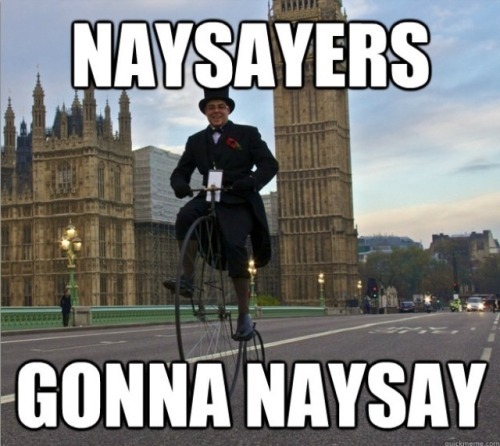 So let them naysay. It won’t get them anything if we don’t let them have anything from it. And I don’t know about you, but I don’t intend to let any of my detractors (few that I have) say anything bad about me and bring me down. No, I’ll keep on writing, editing, publishing, and marketing, and listen to the voices who will help me along in that. And in its way, having those supporters is way better than any riches or fame (though those would be nice). That is a truly horrible response Rami, you are entirely right, and your friend deserves our support (even more so because she doesn’t have a supportive family). Please extend my congratulations to her on that Facebook group because you and I know how much of an accomplishment it is. May she find success and happiness as a published author. I will as soon as she responds to my message. Thanks for commenting Angela. I appreciate it. I don’t understand why they can’t be more supportive, even if they are afraid for her financial future. My parents will always back me up, as long as I can provide for myself, I can do whatever I want. Their words! I think anyone who writes and loves it may call themselves an author, even if they don’t necessarily publish. At least NaNoWriMo tries to convey that message. Not knowing more details, I can’t say. Some people feel that their way of life or their point of view is the only one worth having and that means everyone else is wrong. Others have what someone I know calls a “language of love” that could use a little work. Basically they have a certain way that they express love towards others, and this might be theirs. Or maybe they’re just assholes. Who knows? It’s good to have support from family, and I have mine. They’re some of my biggest fans. But not everybody is that lucky, I guess. Which is why creating a network of friends and supporters among your writing peers is such a good idea. If you can’t get support from your family, you should at least have someone who will. I can only agree. A support network is important no matter what you do to be honest. Yeah, we human beings are social creatures and need that positive interaction. Otherwise we wither inside. I think she will. She mentioned having a few more books on the way, and if the first one does well, then that’ll be the best encouragement an author can get. I think she’ll pull through. SO sorry she is having to go through this 😦 It’s really hard when those close to you don’t support you. Hopefully she’ found a supportive network of friends who will help her overcome all that negativity. Considering the number of responses on the original Facebook post, I’d say she has. Thanks as always for your responses, Joleene.